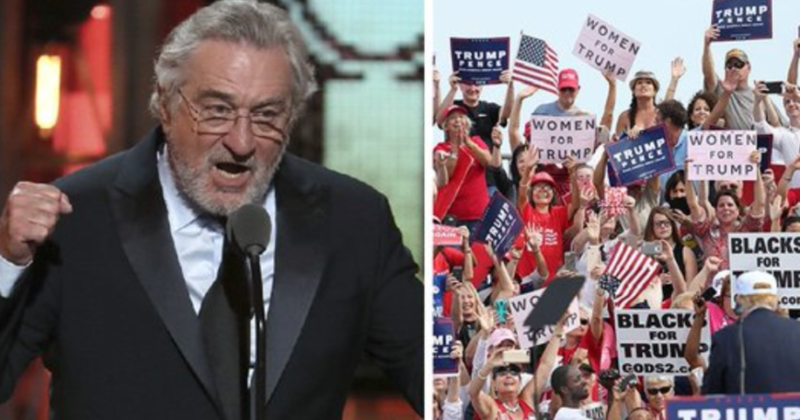 Actor Robert De Niro has been against President Donald Trump since before the 2016 presidential election he won. Now he has taken it a step further by threatening those who support President Trump and his Make America Great Again agenda. “There’s going to be a lot of mass demonstrations, a lot of protests,” the 75-year-old actor said of the Resistance. “But I think there’s going to be a lot of mass demonstrations, a lot of protests if this is not resolved. We have to know what went on,” he said. “We have to know. The handwriting’s on the wall. These people are all crooks; they’re doing it before our very eyes,” he said. “Trump obstructed justice all the time, first by firing Comey and all the other things and saying it on NBC with Lester Holt, I mean, what are we taking about? It’s right before our eyes. Justice has to be served,” he said. Did De Niro not hear that the president was exonerated on the charge of obstruction of justice? It could be that he missed it because he still believes Mueller is going to arrest President Trump. “To me and to many of us, Mueller represented justice. And he still does. He’s been muted by Barr and what’s going on and by Republicans,” he said. “I don’t know what’s happened in this country with the Republicans. I mean, the Republicans with Nixon didn’t do this, but these Republicans are,” he said. “And we’re not gonna forget about them, because when later on, years to come, long after Trump is gone, there are gonna be writers, as soon as any of these characters come out, emerge, in some way, they’re gonna remind us of all the things that these Republicans did during the time of Trump,” he said.